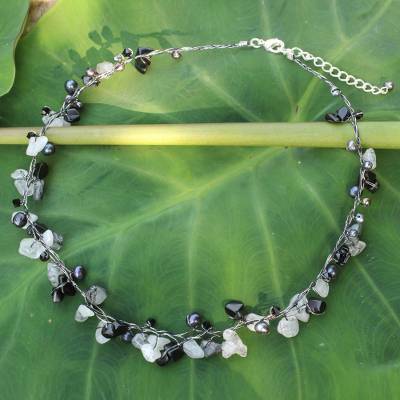 Beaded Quartz and Pearl Necklace from Thailand, "River of Night"
Pearls glow with iridescent allure in a design from Thailand's Sasina. They are threaded by hand on silk strands, creating the illusion of a flowing river splashing with tourmalinated quartz. 925 sterling silver plated brass clasp.